We understand the need for absolute verification that your measurements be as accurate as possible. To ensure accuracy, sound engineering practice requires that you keep your instruments properly maintained and calibrated. It is penny-wise and pound foolish to allow your instrument to lapse in calibration. Oftentimes an "out-of-cal" analyzer can be more costly than one that is out of commission, since it can lead an operator to mistakenly assume his or her measurement results are valid. Your investment in your instrument is substantial - protect that investment by returning your analyzer to the factory at least once a year for cleaning, calibration, and inspection. Our thorough factory inspection process can reveal hidden problems or failing components that may be easily repaired before they lead to a potentially catastrophic failure. Machine not working? Cognitive Vision provides depot level repair services for all of our current and legacy products (below is a partial list of the instruments we maintain). If you do not see your machine listed, ask us anyway - there is a good chance we will be able to repair your instrument, and return it to you in tip-top operating condition. No detail is overlooked because the same engineers and technicians that build our systems also perform the calibration and repair. Has it been more than a year since your machine was last calibrated? Unsure when your machine was last returned to the factory? Protect your investment by giving us a call today - we are here to help! Our number is 619-781-8240. 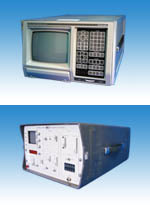 Below is a brief list of some of the legacy products for which we provide calibration and repairs. We are here to help you, so if your instrument is not listed, give us a call.